Where: Kids start on Pinckney St. and run down Main St. to Carroll to finish on Mifflin St. at Wisconsin Ave. Parents/guardians are welcome to accompany younger children who are registered. Cost: $16/child - includes a cool "Kids Race" t-shirt, medal and refreshments. T-shirts must be picked up at the Madison Marathon Expo Friday, Nov. 8 4pm-7pm and Saturday, Nov. 9 9am-5pm at Monona Terrace. 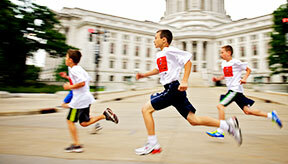 Registration for the 2013 Kids Race is open. Kids can also register at the expo, but shirt size is not guaranteed.